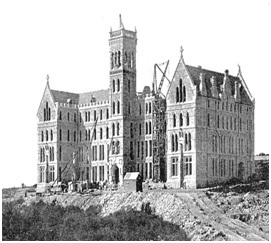 Winning worldwide acclaim, St Patrick’s College was designed as a blend of Neo-gothic and Romanesque styles by well known 19th Century architects, Sheerin and Hennessy. 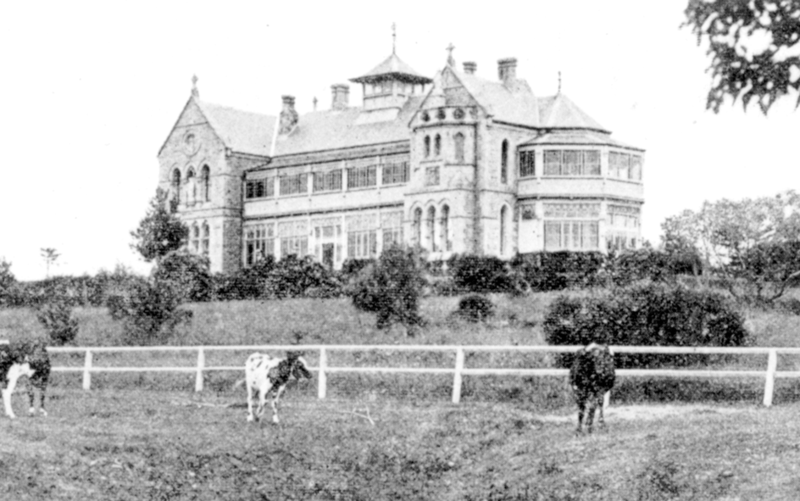 It was built by WH Jennings between 1885 and 1889. The stone building is four storeys high with a six level central bell tower and a slate roof. A two storeyed colonnade flanks the central entrance. The building was designed with modern plumbing and a service lift. Moran House illustrates an architectural initiative designed to stand the test of time, using simple planning methods and good materials including stone quarried from North Head, finer stone sent by barge from Pyrmont, along with slate, selected Cedar and Jarrah timbers, marble and leaded glazing. The entrance vestibule and ‘cloisters’ with cedar and kauri pine ceilings, stained glass windows and marble tiled floor lead to a monumental stone staircase. The library (former chapel), refectory, aula maxima, lecture rooms and private oratory on the ground and first floors are impressive in scale and detailing and designed to form a sequence of grand interiors, some with large interconnecting doors. The second and third floors provided accommodation for the seminarians. The College use of this building ended in 1995. Major conservation works to Moran House were completed in 1996. The building is now leased and occupied by the International College of Management, Sydney (ICMS). The historic Archbishop’s Residence was built in 1885 and was the first structure completed on the site. It is a good example of the domestic Gothic Revival style designed by Sheerin and Hennessy Architects. While its Gothic detailing can be held to be in the tradition established by architect AW Pugin (1812-1852) in England, the cast iron verandahs are a 19th century response to the colonial climate. Other elements such as the central flèche and convenient planning foreshadowed Edwardian architectural trends. The cast iron panels of the verandahs contain Cardinal Moran’s initials and their detailing reflects the later 19th century ‘Aesthetic Movement’. Two terracotta statues of saints dominate the bays of the main elevation. The building is two storeys of stone with a slate roof. It was built by William Farley for 10,000 pounds. Over time verandahs have been infilled and the stable block altered, but the original fabric remains generally intact. The landscape setting comprises chiefly cast iron gates with stone piers to Darley Road, the driveway, a carriage loop and a vista to the harbour and related plantings to all the above. In 2004 conservation and adaptation works were undertaken to the Archbishop’s Residence to convert the existing residence to an educational facility as part of the adjacent St Paul’s Catholic College. Curiously it was not until 1935, over twenty years after Cardinal Moran’s death in 1911, that the Cardinal Cerretti memorial Chapel was built. In 1935 the Cardinal Cerretti Memorial Chapel was opened adjacent to and in architectural harmony with the main building, enhancing and enriching the total atmosphere and impressive power of the site. Despite (or rather in addition to) the Roman, Vatican, implications of the name, the Cerretti Chapel was another affirmation of its Australian roots. Cardinal Cerretti had come to Australia in 1915 as the first Apostolic Delegate, diplomatic representative of the Papacy in Australia. Cardinal Cerretti delighted a St Patrick’s College prize giving ceremony in 1916 by proclaiming ‘Australia for the Australians’. The Chapel was built to complement St Patrick’s College in architectural style, materials and detail. It has a column-free nave and features fine marble altars, silky Oak joinery and stained glass windows. 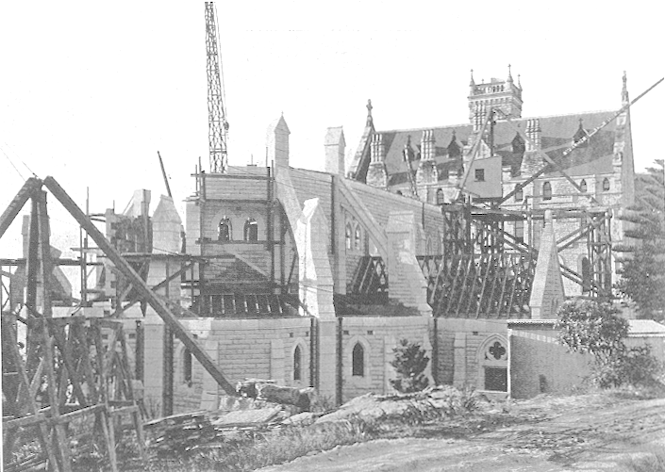 The Convent was designed by Ernest A Scott of Green & Scott Architects to provide accommodation for the Order of Our Lady Help of Christians. Built in 1934, it is two storeys high with rendered walls and stone trims. Its main elevation is accented by a copper turret denoting the Chapel and a major archway framing the outlook from a verandah. The verandah was originally glassed in. The Chapel was originally a two storeyed space with a vaulted ceiling behind the eastern bay and several small stained glass windows. The building is considered a well resolved domestic Edwardian dwelling. The Convent was linked to the College by a concrete pedestrian bridge. The residential addition, designed by Sydney G Hirst and Kennedy Architects and constructed in 1962, does not complement the original Convent. 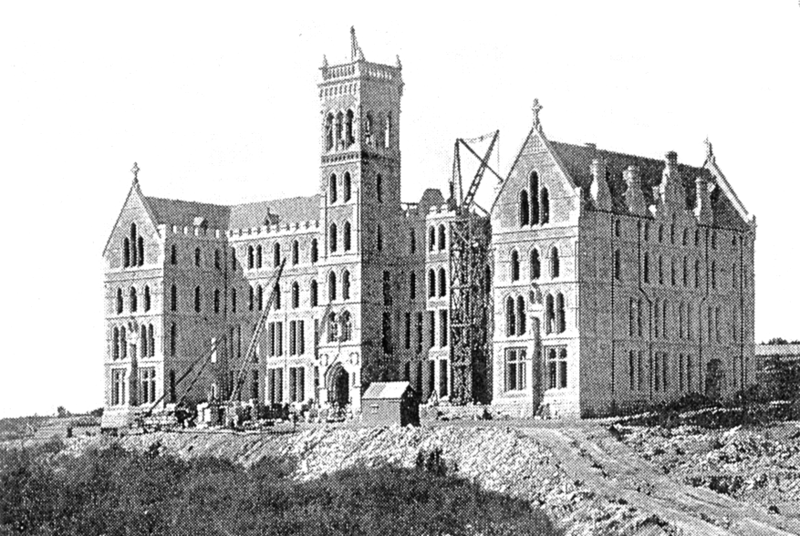 In 2004 conservation and adaptation works were undertaken to St Therese’s Convent to convert it to offices and meeting rooms as part of the now leased space to the International College of Management, Sydney (ICMS). The next building on the site in 1954 was a response to overcrowding and to cope with increasing student numbers. 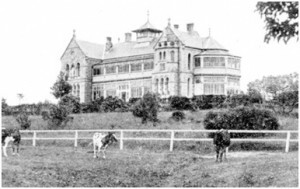 Kelly House was opened in the year in which St Patrick’s College Graduates reached a total of 1,000 since its foundation. 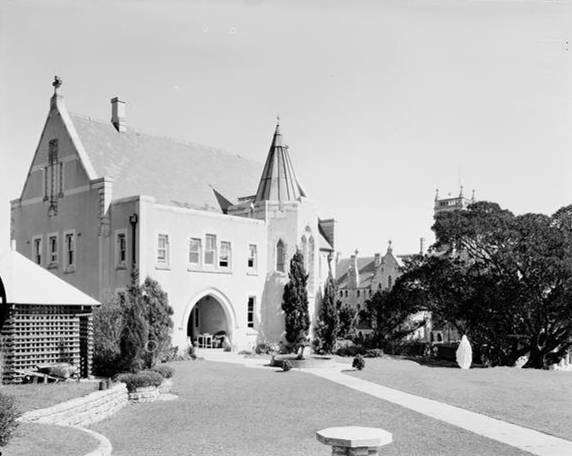 It was named after Archbishop Michael Kelly, Archbishop of Sydney from 1911 to 1940. It was functional, utilitarian, providing the structures to meet the necessary religious services under the stress of severely limited financial resources. The post war explosion of demand for churches and schools for a rapidly increasing Catholic population stretched financial and human resources to their limits. In this context, housing increasing numbers of trainee priests was a matter of providing bricks and mortar, not of architectural magnificence. It was not a time, nor was Cardinal Gilroy of a mind, for anything beyond basics. 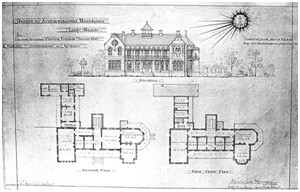 It was enough that Kelly House be adjacent to the main building, rather than integral to it. St Paul’s Catholic College complex was built over a period of ten years from 1964 to 1974, officially opened on 8 August 1965. The buildings are concrete framed with face brick infill panels providing classrooms and staff and student amenities. Gilroy House, named after Cardinal Gilroy, was designed by Jenkins and Maclurcan Architects and built close to the Archbishop’s Residence. It was opened in 1961. Although not evident at the time, it signified the beginning of a change of function and direction on the Manly site. Diversity and new demands had arrived. The 1970s saw the College liberalised internally and soon opened to a wider studentship – the laity (both men and women) and to Christians of other denominations. In 2002 approximately 200 theological students were undertaking courses at the College and women held significant staff positions. It was entirely appropriate that a Manly building be named after Cardinal Norman Thomas Gilroy; Australian born, returned from Gallipoli in 1915, trained as a priest at Manly and in Rome, successor to Archbishop Michael Kelly as Archbishop of Sydney in 1940, the first Australian born Cardinal, presiding over an era of demands and expansion, Cardinal Gilroy was a prominent figure of his time. Gilroy House and the St Paul’s College complex (that followed in 1964-74) were comfortable, functional developments placed on available ground for practical religious purposes. Gilroy House contained three chapels and three sacristies. It was a single/double storey concrete and steel framed building around a central open courtyard with face brickwork and steel deck roofing. It was demolished in 2004. This single storey building of rusticated coursed sandstone with a slate roof and bullnosed corrugated iron verandah was built in 1910 to provide a gymnasium and two billiard rooms for the seminarians. It is a simple building of the ‘Federation’ architectural style. The building was altered in the 1970s to accommodate teaching areas and a workshop. In 1995 the Pastoral Centre was adapted into a covered courtyard and café to provide student facilities for the International College of Sydney. Prior to the transfer, the Church grounds had been bounded by a ‘high galvanised iron and barbed wire fence’. By the 1900s, a stone wall had been constructed along the new south eastern boundary. A strip of land 66 feet wide through the grounds was dedicated for the extension of Darley Road in 1879 and its use as a public road was declared by proclamation in the Government Gazette on 22 October 1887. Construction of the road was not undertaken, however, until World War I. In return for the land lost, the Army – which used St Patrick’s tower for military observations during the war – built the stone walls which still flank Darley Road. The walls may have been built in stages between 1914 and 1932.
consciously created landscaped settings to both buildings. For a period between the completion of the main buildings (1886-1889) and the construction of Darley Road, the College was served by a different series of access routes than those in use today. The historic Archbishop’s Residence and the St Patrick’s College were once linked by a carriageway. The original carriage access can be deduced with some degree of certainty, although the extension of Darley Road may have obscured some features. The earliest driveway to the College appears to have entered the grounds from Fairy Bower Road and led directly to the College forecourt. In both cases the original driveways curved across the landscape and permitted oblique views to the important buildings. The drives were planted in avenue formation, and the surroundings along the length of the drive were improved by related plantings, for example, in the vicinity of the Grotto and in the stretch which originally linked Moran House and the Archbishop’s Residence. These remain prominent even now. This driveway branched at the grotto, with one arm turning back towards the Residence above the grotto and then formed the driveway to the Residence, ending in a carriage loop or turning circle. 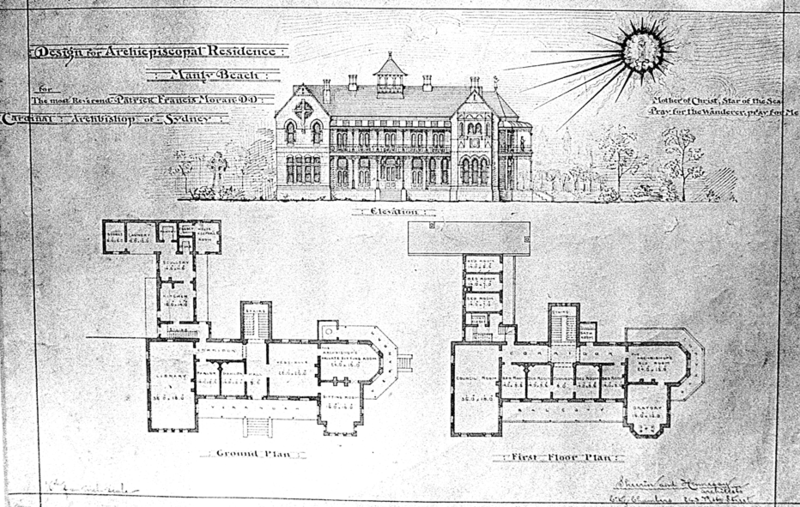 With the extension of Darley Road in 1914, access to the College and Residence underwent substantial change. With the Army building two sections of a boundary wall on either side of Darley Road, three wrought iron gates were also installed. The roadway and turning circle to the Residence were resurfaced with gravel and a new driveway constructed from Darley Road to the College. 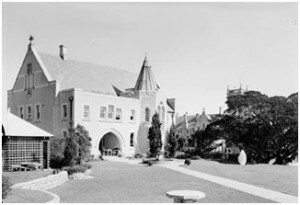 With the completion of the Convent in 1934 and Chapel in 1935, access to the rear of the College was again adjusted to create the existing entrance and roadway. An aerial photograph of the Estate dated 1937 provides valuable information regarding the landscape development of both sides of Darley Road. The location of the driveways is clearly evident. There are four secondary paths which focus on the Archbishop’s Residence. The first path leads directly from a gate in the Darley Road wall to the Residence. Another path now known as the Archbishop’s Walk, leads from the Residence down to Spring Cove. This path was used to access the terraced gardens, with orchards, vegetable gardens and flower beds, and to the lower parts of the site and the Harbour foreshore. The path was constructed over the first and second terrace areas and linked to the terraced garden areas and became an informal track through the lowest terrace to the Harbour foreshore. It is likely that the decline of the gridded pattern of the land below the Residence accompanied the abandonment of the path as an access to the Harbour foreshore and wharf, previously having been the only link to transport to St Patrick’s Estate. All that remains of this path are sets of stone steps below the former Gilroy House, sets of stone steps below the Archbishop’s Residence, stone steps on Spring Cove and a depression in the ground adjacent St Paul’s Catholic College tennis courts. Another path led east from the Residence and culminated at the stone boundary wall. Two large figs flanked the path at its termination. The construction of St Paul’s Catholic College removed this path. The figs are still in place. The fourth path branched off the entrance driveway to the Residence and ran down the site parallel and close to the western boundary providing some vehicular access to the terraced gardens below the Residence. A major portion of this path remains evident on the site. A section of the pathway runs parallel to the remnant dry stone wall north of Gilroy House. Little remains of the secondary access routes on the northern side of Darley Road. The ‘Long Walk’ roadway from the College to the north east portion of the site, evident on the 1937 aerial photograph, exists as a track through the re-growth (with grass and fill having reclaimed the quarry and tennis courts).